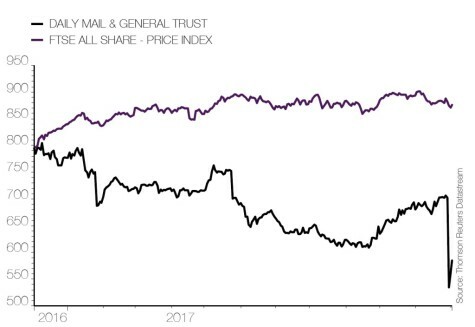 Shares in publishing, events and professional information business Daily Mail & General Trust (DMGT) are bumping along close to a five-year low as it points to a tough 2018 for its consumer-facing businesses. Alongside full year results (30 Nov) the company guided for its media arm, encompassing brands like Daily Mail, Mail on Sunday and MailOnline, to see a mid-single digit underlying revenue decline in the 12 months to 30 September 2018. The market had expected a flat performance. 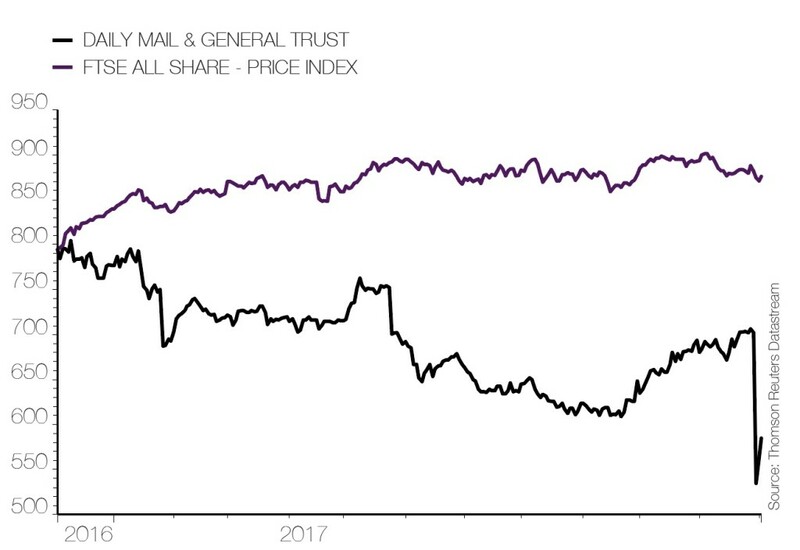 The guidance also compared unfavourably with the 1% growth delivered in the 2017 financial year, when MailOnline increased its revenue by 20% and moved into profitability. Further damage to sentiment resulted from a £206m impairment charge on several investments including Genscape, Xceligent and SiteCompli which helped drag the company to a £112m loss for the September 2017 financial year. Corporate costs for 2018 are also expected to be £8m higher than previously thought at £45m and performance on the business-to-business side will be impacted by recent disposals and the planned sale of its EDR commercial real estate service. The latest news has done significant damage to an already depressed share price. Despite recovering slightly, the shares currently remain more than 20% below the levels at which they traded before the downbeat commentary was published. Investment bank Berenberg, which recently initiated coverage on the stock with a ‘buy’ recommendation, argues the share price decline is an over-reaction despite cutting September 2018 earnings per share (EPS) estimates by a similar quantum to the share price fall at 20%. The bull case for this business has typically focused on the fact it is no longer a traditional newspaper entity but instead a higher quality operation more akin to Informa (INF) or RELX (REL) providing subscription-based information services to professional industries and running events. However, in 2016 the media business was still the biggest contributor to reported revenue at 41%. The heavy share price sell-off probably reflects some frustration with the pace of change. Panmure Gordon analyst Jonathan Helliwell commented that 2018 will be ‘arguably the fifth transitional year in a row’.